Forms allow your visitors to send data to somewhere on the Web -- usually to your web server. Your server will have some kind of script which processes the form data and takes whatever other action is required. This action will usually involve an acknowledgement to the sender -- your visitor. Another use is as a simple menu system to navigate around your pages. 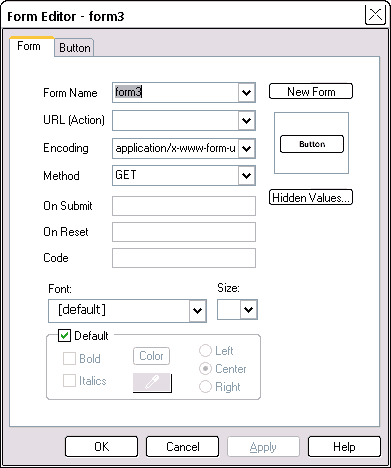 Access the form objects from the main menu Object > Forms. The sub-menu has a list of all the objects available and also a checkbox for the Forms Toolbar, which is shown checked on the right. On the main Menu View > Toolbar Options ... you have the option to set bigger buttons.  See Workpage tutorial: Toolbars. Below we look at each form object, concentrating on the most important controls. Let's start on forms by adding a simple button to your page. Click the Form Button button, then click your page where you want the button to be placed. Drag the edges to make it bigger or smaller. Double-click the new button you just placed -- this opens the Form Editor. All form objects belong to a form. When you place a form object on your page, the property sheet has two tabs, one for the parent form and one for the object itself -- which is just another object. It's good practice to give forms a meaningful name. We will rename ours to formIntro from the default form3 you see in the property sheet to the right. To edit an object's properties you can also select the object, then click the Edit Form component on the bottom toolbar -- this will be enabled (not grayed out) when you have a form object selected. This field specifies the URL of a script that will do something with the form data. This can also be an e-mail address. However, the e-mail programs that people use are very variable, and there is no guarantee that they will pick up the form data correctly, or even send it! So we don't recommend using an e-mail address, however tempting that might be. Typically the URL(Action) field will be a relative path to a file on your own server. You are then relying on your server to do something sensible with the data -- see form mail scripts. text/plain: use when the Action attribute points to a mailto URL. GET the default, will send the form input appended to the URL and separated by a question mark (?). If you look at the url in your browser after doing a Google search, you will see the ? and data which represents the search details. Use this method for simple database queries. POST sends the data in the body of the submission. This means you can send larger amounts of data, and that the URL for the form results doesn't show the encoded form. Use this method where the submission might (eventually!) change a database, or send Email. The Form is the name of the parent form -- all form objects must have one. The Type is a button here, but if you decide it should be something else, select it from the drop-down list box. You won't lose all the data you may have already entered for the object. All form objects have a Name and Value. It is useful to give each form object a meaningful new name. This name will appear when you submit the form, or may be accessed by code. The value is variable. It can be the name of a button, or the data in a text box. Use the Code field for any extra code. One common item is to add an "onClick" event -- requesting some function when the object is clicked. Another is to apply a CSS style. When you leave the Default font checked, the font used will be that set via the Page Editor > Links, Fonts tab > Default Font. We used Verdana 10 pt for these tutorials, so if your default font is much larger than that, you may find your text is too large to fit in some of the form obects. In the drop-down Font list, notice the green "WS" against some of the font types. These denote the fonts that are web-safe -- we suggest you stick to those. The controls towards the bottom of the tab allow you to give a variety of treatments to the edges of the object -- they are grayed out when not applicable. The Color setting controls the color of the outline, not the color of the body of the object. The buttons below show some of the treatments you can apply to all form objects. 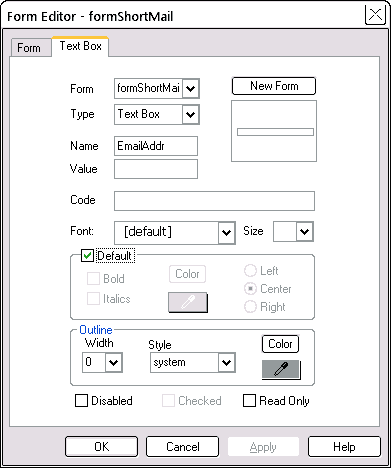 They show each of the possible styles available in the drop-down Outline Style box, and have an outline Width of 5 pixels. Two of the styles, System and None, do not allow you to change the outline width or color. The background color of the main body of form objects, which we have also changed in the examples, is not available in the Form Editor, but is available on the Quick Editor > Shading tab. You can use a textured shading as shown by the ridge style button -- preview to see the effect. The exact effect you see is somewhat determined by the browser you are using. 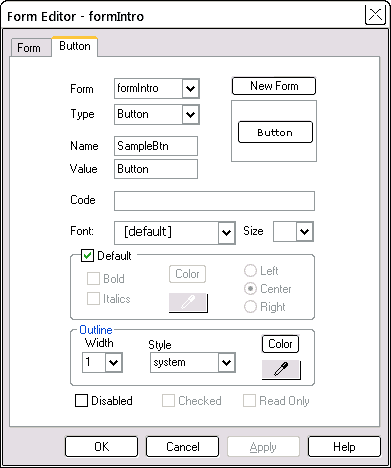 To switch objects to another existing (not new) form: with the object selected, select the existing form from the drop-down Form list. This does not move the location of the form object -- it just changes its parent. Let's now look at each of the form objects that are available. Buttons hardly need further explanation! See Getting started with forms. Reset sets all data on the form back to its starting condition. For a large form, this is a dangerous command because clicked accidentally, your visitor would lose all their input data. Common workarounds are to use the On Reset event of the form, also available on the Form tab, to restrict its action, or at the very least, present an "are you sure?" message. In preview, try the Reset button just above. Checkboxes have two states -- they can be either checked or unchecked. Compared to radio buttons they are independent of each other. The starting Checked state is at the bottom of the Checkbox tab on the property sheet. Radio buttons also have two states -- they can be either checked (selected) or unchecked. But only one radio button of a group can be checked at any one time -- and you should have at least two buttons in the group. You can see this operation in preview. Control which buttons are in a group by setting their Name property. Buttons with the same Name will interact with each other. Those with a different name (in a different group) will be independent. An image can act much the same as a button. Use the image button to select the location of the image to display. You can resize the image just like any other image. If you have assigned a URL (Action) to the form, clicking the image will cause the form details to be sent to the URL. This is the same action as for the Submit button. The image can be anything you like -- we've chosen an image that from the ClipArt folder. To the basic image, we added a border of 3 pixels with a style of double, both set in the Form Editor for the image. You can also set the border thickness and color from the Quick Editor, but not the style -- you can do that only from the Form Editor. The default state for the image is Anti-Alias and Re-Render both on. Where you are reusing an existing image, you should turn these both off and avoid creating an extra unnecessary image. These settings are in the Quick Editor > Object tab. 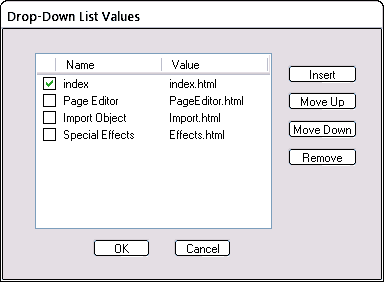 A Selection List has a list of Names and against them a list of Values. You as the form designer fill out these values -- not your visitor. You present a list of choices, the Names, to your visitor and they will select one or more depending on how you set it up. If you click the Values button of the Selection List tab, you will get a dialog box like the following. The checkboxes determine the entries that will show as selected (highlighted) when the list box opens. For a drop-down list box, it makes sense to check only one entry. That's all your visitor can select at one time! Check Multiple to allow multiple selections -- two or more items to be selected at one time. The Name column contains the entries that will appear when published (or in preview). The Value column is the corresponding value you want to be used when your visitor selects an item. In preview, the selection lists here will show only the Names potentially available -- if you want something more to happen, see menus with selection lists which use the Values to jump to other pages. To select a range, hold down Shift and click a second item. All selected items will show highlighted. A text box allows your visitor to enter and edit one line of text. The text will scroll horizontally if it is too wide to fit in the box. You can mark the box Read Only if you don't want your visitor to edit the text already here. The Value field sets the initial text. This is just a text box, where the entered text is masked off by blobs so that you or anyone snooping over your shoulder can't read it. Again the Value field sets the initial text entry. Create it as for a text box, and then select a Type of Password. A text area allows your visitor to enter and edit more than one line of text. It is like a big text box except the scrolling is vertical. The File Upload box allows your visitor to browse and select a file name and have that file uploaded along with the form details. For this to work, you need to have the Form Encoding to be set to multipart/form-data. The left hand part of the box, the bit that holds the file name is normally closed up. Drag it out to the left to make a good-sized space. The file name will appear in the box after your visitor has browsed to the file name. When you have a form object selected (e.g. by clicking on it) the Form edit button will become enabled. Clicking it will allow you to edit that form object. You can also select the object by double-clicking it. If you intend to use the same font throughout your forms (a good idea! ), consider setting it up in the Page Editor > Links, Fonts tab. This font will then be used whenever you leave the font at [default] in a form object. The form items we have looked at here may not look like they are on a form, but they are nonetheless. They all belong to a form called formIntro. If you look at the finished code, you will see them all grouped together near the top. To put form objects into the same form, select all the objects and make a permanent group. If the objects are currently in different forms, you will be prompted to create a new form for those objects. After that, you can un-group. One common way to navigate around the fields of a finished form is to use the Tab key. Pressing Tab moves the cursor on to the next field. It helps if the tabbing is in a logical sequence! To re-order the objects into tab order (or z-order), select the objects, one at a time, in the order you want them to appear, and press the "to front" button for each one. So, select the first object, press "to front", select the second object, press "to front" and so on. where N is the tab number (starting at 1) to be assigned to that object (image below). The tab key will then move the cursor to the next numbered object, regardless of the z-order within the form. 1. You click your Submit button and nothing happens. A Submit button looks exactly the same as a regular button. Make sure your submit button has a type of "Submit" -- select the type in the drop-down list box on the Button tab headed "Type". This means that when clicked, the button will submit the form data to your host. 2. Forgetting that form object names are case-sensitive. A field called "Email" is not the same as one called "email". If a script on your host is looking for a field called "Email" but your form sends it one called "email", your host will not accept that data. 3. Two or more objects with the same name. The default action of SiteSpinner is to give all form objects a unique, but boring name -- formxx. If you are renaming your form objects, make sure you give each a unique name. Exception: radio buttons of a group all have the same name. 4. Where your form relies on a script, not uploading the script to your host. See Form Mail: Upload the script file. 5. Your submit button works, but doesn't submit all the data you expect. Make sure all your form objects belong to the same form.